The band would like to send their best wishes to our former 2nd Horn Player Malcolm Whitfield after he has just undergone a successful hip replacement 3 weeks ago and is now free of pain and regaining his mobility. Malcolm decided to step down from contest commitments and he is hoping to return to rehearsals with Driffield Silver Band next week. 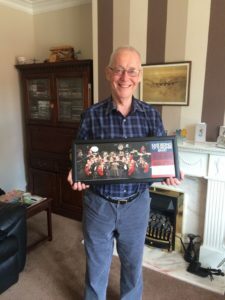 Dave Vivian, East Riding of Yorkshire Band Chairman presented him with a framed print of the band from the areas in March as a momento of his time with us. He asked to be remembered to the band and wishes us well for the future. He is keen to get a copy of the band CD Marching Onward on its release.